application containers that mostly won’t really care about the cgroup layout. Here be dragons: some of what I say is likely invalid by now or I’ve come up with simpler solutions. As you can see, most controllers (e.g. devices, blkio, cpuset) are mounted into a separate cgroup hierarchy. They could be mounted differently but given that this is how most userspace programs now mount cgroups and expect cgroups to be mounted other forms of mounting them rarely need to be supported. To be honest, this is not my favorite cgroup layout since it could potentially mean that some cgroup controllers are mounted into separate legacy hierarchies while others could be enabled in the unified cgroup hierarchy. That is not difficult but annoying to handle cleanly. However, systemd usually plays nice and only supports the empty unified cgroup hierarchy in hybrid cgroup layouts. That is to say, all controllers are mounted into legacy cgroup hierarchies and the unified hierarchy is just used by systemd to track processes, essentially replacing the old named systemd legacy cgroup hierarchy. This will likely be the near future. LXC in current git master will support all three layouts properly including setting resource limits. So far, LXC has only provided the lxc.cgroup. * namespace to set cgroup settings on legacy cgroup hierarchies. For example, to set a limit on the number of cpus on the cpuset legacy cgroup hierarchy one would simply specify lxc.cgroup.cpuset.cpus = 1-2 in the containers config file. The idea behind this is that the lxc.cgroup. * namespace simply takes the name of a cgroup controller and a file that should be modified. Similar to the lxc.cgroup. * legacy hierarchy namespace we have now introduced the lxc.cgroup2. * namespace which follows the exact same logic but allows to set cgroup limits on the unified hierarchy. This should allow users to easily and intuitively transition from legacy cgroup layouts to unified cgroup layouts in the near future if their distro of choice decides to do the switch. One of the first benefactors will be LXD since we have some users running on unified layouts. But of course, the feature is available to all user of the API of the LXC shared library. Most low-level software engineers that have an interest in new technologies will probably already know what this post is about: checkpoint/restore in userspace. But this post is – unlike most posts about this technology – not aimed at low-level software monkeys like me. I would rather like to have people outside of academia and engineering understand what CRIU is and why it is one of the most exciting technologies in recent years. Imagine having an important program running, I mean a program so important that taking it down is unthinkable. Think about a program that manages your bank account, all your precious, precious finances. It would be a shame if it would go down and all the runtime information associated with that program is now lost. Runtime information is basically that part of a running program that is very volatile. Meaning, this information is usually lost when the program stops or crashes unexpectedly. Some of this information though can be very vital and important to someone. I’m using this term loosely here. Runtime information in that sense is anything that e.g. has not yet been written to disk. Information that somehow is not yet safe in any way. Think of it as having a very heavily loaded paper bag with all your groceries. You have no choice but to carry it all in this bag but until you set down that bag on your table at home to unpack it this thing could rip at any moment. Runtime information might be information such as the last financial transactions from a big banking deal you just struck. What if you need to evacuate that program because there’s an impending hardware failure or you’re worried that you need to restore it somehow with all the given state this program carries at a specific point in time – all the precious runtime information. There aren’t a lot of ways to achieve this. The funny thing is that this very simple problem I tried to describe is one that actually a lot of companies have. Take all the replication or saving to disk and backups that you need often this is still not enough. You might still need to touch that program while it is running in a very sensitive way which might cause it to crash and then the runtime information will be lost. You may be able to restore it but think about a heavy program that needs to now reinitialize a database, restore from a bunch of backups and come back to the point of execution it was at before the crash to continue operation. Sure, 5 minutes doesn’t sound like a lot but 5 minutes not serving paycheck information for a couple of big companies and you’d be surprised how fast a seemingly minor annoyance becomes a major crisis. But what if you could literally snapshot a running program with all its state dump that state to disk and on crash restore that program to the exact point of execution it was before it crashed. You guessed it CRIU allows you to do it. Even better you can live migrate a program while it is running. Think about a machine that is about to fail or has to be taken down. CRIU would let you send that program from one machine to another without stopping it. Think about how crazy ingenious this actually is and what engineering feat. It’s like moving your whole household from somewhere in Europe to Japan without a single thing being changed or lost. CRIU is a cross-company effort with strong ties to academia and research. I’ve had the pleasure of getting to know a lot of the guys who are developing CRIU not just are they extremely nice and competent, the work they have done is absolutely impressive: from an engineering perspective and from actual potential for real-world impact. This was definitely needed! Thanks. 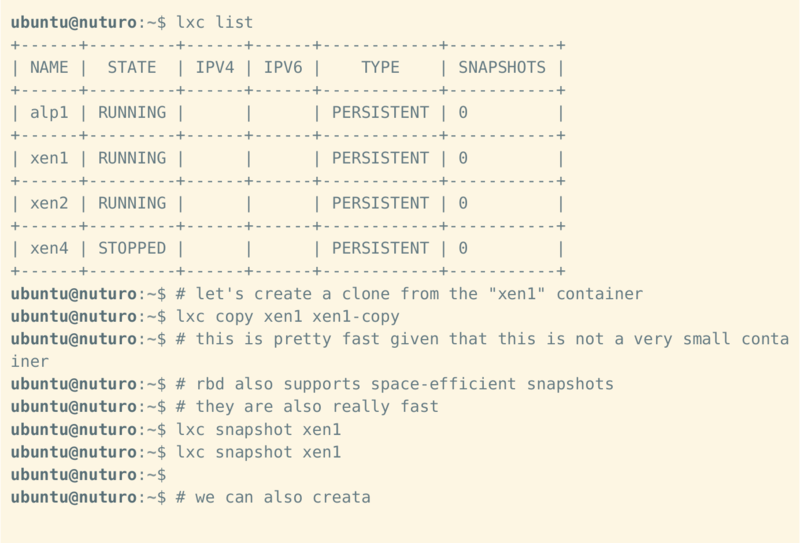 It’s now possible to use CNI (container networking interface) with lxc. Here is an example. This requires some recent upstream patches, so for simplicity let’s use the lxc packages for zesty in ppa:serge-hallyn/atom. Setup a zesty host with that ppa, i.e. Next setup CNI configuration, i.e. Some packages install binaries with file capabilities, and fail to install if you cannot set the file capabilities. Such packages could not be installed from inside a user namespace. With this feature, that problem is fixed. POSIX capabilities are pieces of root’s privilege which can be individually used. File capabilites are POSIX capability sets attached to files. When files with associated capabilities are executed, the resulting task may end up with privilege even if the calling user was unprivileged. Even before LXD gained its new powerful storage API that allows LXD to administer multiple storage pools one frequent request was to extend the range of available storage drivers (btrfs, dir, lvm, zfs) to include Ceph. Now we are happy to announce that we fulfilled this request. As of release 2.16 LXD comes with a Ceph storage driver. The command line experience for Ceph is similar to the other storage drivers. Anyone who has played with the storage API should feel at home right away. Without going into too much detail of the inner workings of Ceph itself there are a few details one should keep in mind. LXD itself is not concerned with administering the Ceph cluster itself. 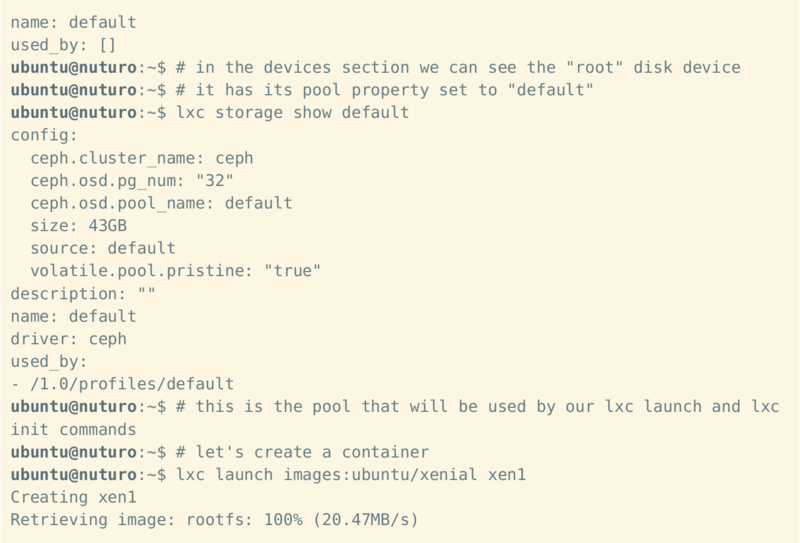 Instead, LXD can be used to create and administer OSD storage pools in an existing Ceph cluster. The OSD storage pool is then used by LXD to create RBD storage volumes for images, containers, and snapshots just with any other storage driver. Now that we have created two OSD storage pools we are ready to create containers in them. Let’s see if it all goes well. By adding the Ceph storage driver to the storage API LXD gains support for distributed storage. This makes LXD even more suitable for use in critical production environments and in using containers at a very large scale. Administration is easy and intuitive through our storage API. I hope that this short introduction has given you a good impression on what the Ceph storage driver is currently capable of. We have more documentation available in our Github repository and are always open to feature requests and happy to lend support. The Ceph storage driver was fun to implement. I hope you have as much fun using it as I had writing it. will let you retrieve (nearly) all properties. The RBD and BTRFS tools lack this ability which makes them inconvenient to use at times. 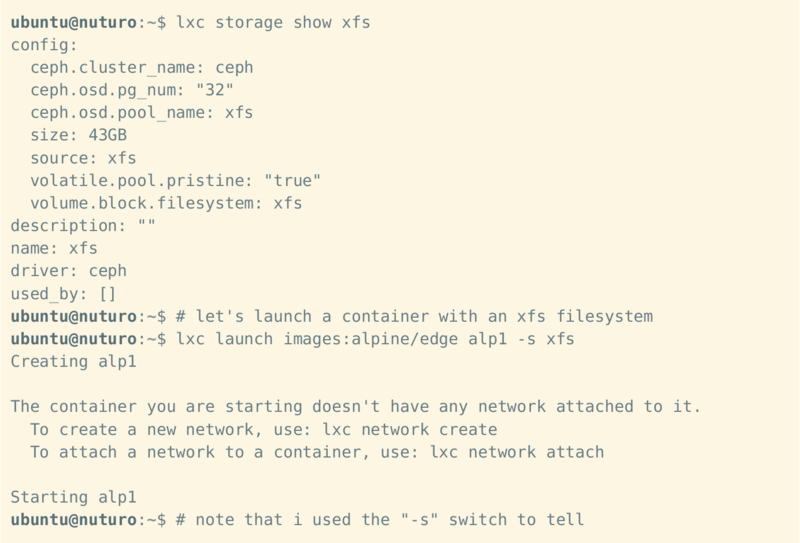 One of our main goals is to make lxc exec feel as similar to ssh as possible since this is the standard of running commands interactively or non-interactively remotely. Making lxc exec behave nicely was tricky. The root of the problem lies with stdout being kept open which is necessary to ensure that any data written by the process the user has started is actually read and sent back over the websocket connection we established. As you can imagine this becomes a major annoyance when you e.g. run a shell session in which you want to run a process in the background and then quickly want to exit. Sorry, you are out of luck. Well, you were. Voila. This obviously only works nicely when a) the exit code doesn’t breach the 8-bit wall-of-computing and b) when the executing program doesn’t use 137 to indicate success (Which would be… interesting(?).). Both arguments don’t seem too convincing to me. The former because most deadly signals should not breach the range. The latter because (i) that’s the users problem, (ii) these exit codes are actually reserved (I think. 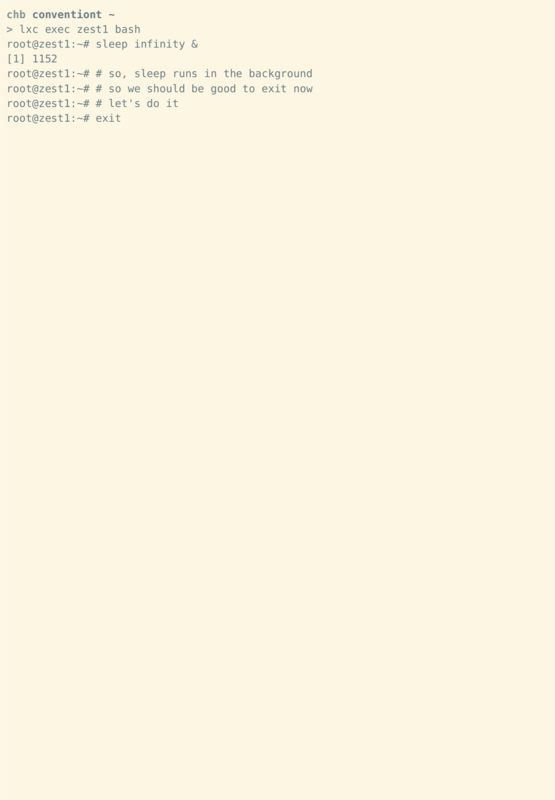 ), (iii) you’d have the same problem running the program locally or otherwise. The main advantage I see in this is the ability to report back fine-grained exit statuses for executing programs. Note, by no means can we report back all instances where the executing program was killed by a signal, e.g. when your program handles SIGTERM and exits cleanly there’s no easy way for LXD to detect this and report back that this program was killed by signal. You will simply receive success aka exit code 0. This is probably the least interesting (or maybe it isn’t, no idea) but I found it quite useful. As you saw in the SIGKILL case before, I was explicit in pointing out that one must send SIGKILL to the executing program not to the lxc exec command itself. This is due to the fact that SIGKILL cannot be handled in a program. The only thing the program can do is die… like right now… this instance… sofort… (You get the idea…). But a lot of other signals SIGTERM, SIGHUP, and of course SIGUSR1 and SIGUSR2 can be handled. So when you send signals that can be handled to lxc exec instead of the executing program, newer versions of LXD will forward the signal to the executing process. This is pretty convenient in scripts and so on. Er konnte in der Stadt stehen und die Hände an der sauber gehaltenen und eitel ausgewählten Kleidung reiben und doch das Gefühl von anhaftendem Schmutz haben. Dieser Eindruck nährte sich verschwommen aus einem ihm anhängenden Bild: seine Zunge über dem Boden dicke Bluttropfen verlierend und er war um des Überlebens willen gezwungen ihnen hinterherzulecken. Und nicht einmal der Dreck war es, der ihm zu schaffen machte, sondern das absonderliche und rothölzerne Kratzen der Zunge an dunklem, rauen und abgewetzten Asphalt großstädtischer Bürgersteige. Und wenn er mit den Händen an den weichen Hosenbeinen entlangfahrend in der Straße stehend diesen Gedanken fasste, dann zuckte er merklich zusammen. Manchmal konnte er nicht von dem Gedanken lassen und er wusste, wenn er zu lange wartete, würde er von weiteren, unkontrollierbaren Wahrnehmungen befleckt werden und sich an ihnen erfreuen. So überkam ihn das Geräusch der über den Boden kratzenden Zunge. 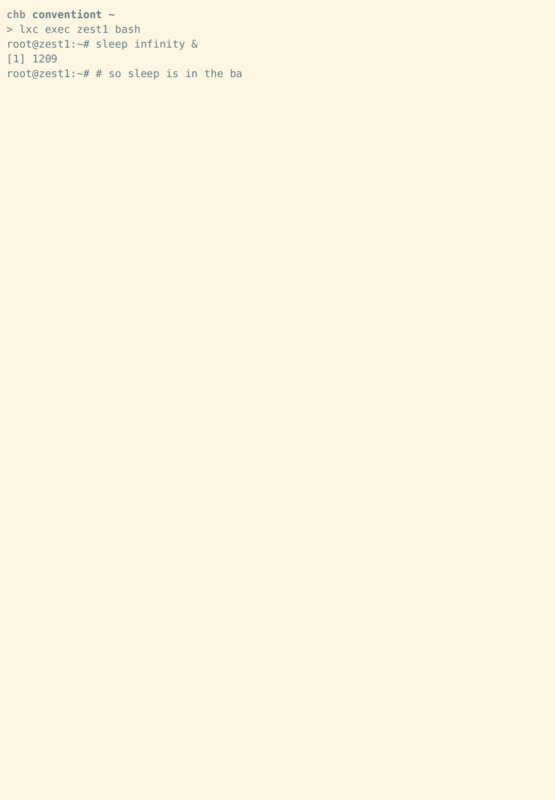 Es war als legte er sein Ohr vorsichtig, den Kopf langsam absenkend, einem schabenden Geräusch entgegen, dessen gutturale Farbe weißlich schimmernden Ekel hervorrief. Er ging weiter. Nach einer Weile konnte er fühlen wie die starren Wege unter seinen Füßen aufweichten, bis schließlich der Boden brach und ihn in vages Dunkel zu ziehen schien. Als er merkte, dass er sich in diesen Gedankenspielen verlor, erhob er seinen Kopf, rieb die Hände erneut an seinen Hosenbeinen und achtete auf das unangenehme lauwarme Geräusch, das dadurch entstand. Es erinnerte ihn an die modrige Struktur der Gebäude und das wässrige Auge dieser ganzen Stadt. Sie schien wie ein Zyklop auf ihn herabzustarren. Seine Augen hingegen waren taub und degeneriert. Vielleicht konnte er deshalb nicht sehen, dass die Wände auf ihn herab schrien, sondern konnte die rissigen und faltigen Verbeugungen des herabbröckelnden Putzes nur schmecken.